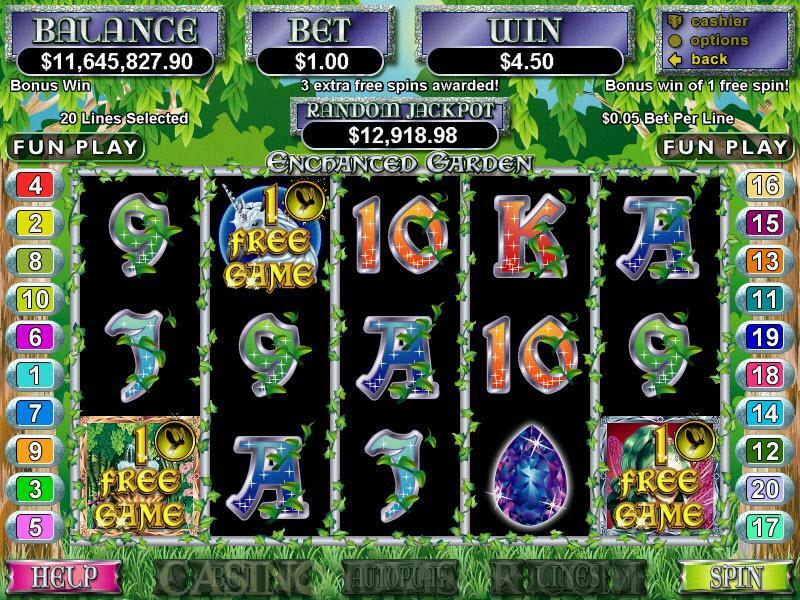 Out of the well respected line up of Real Time Gaming comes a captivating new release called Enchanted Garden that will surely capture the attention of those who are looking for a charming and fast paced video slots experience. 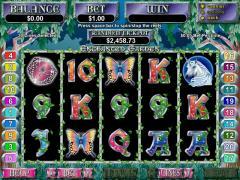 A huge video slots game with 5 reels and 20 pay-lines of intense action, Enchanted Garden includes a host of outstanding features with a uniquely appealing fairy tale motif. 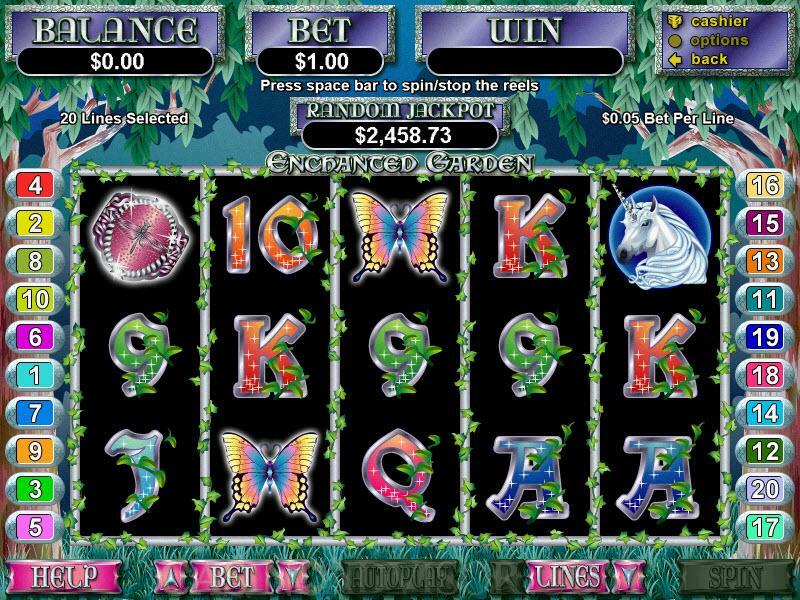 Enchanted Garden offers a main mode appropriately called the Garden where you will see different sized rectangular dirt grids. Each of these grids are split up into squares, each of which contain different garden-related symbols such as butterflies, acorns, worms, bugs and a host of colorful plants and flowers. The object of the game is to match four or more of the same kinds of symbols into the larger squares by turning them around. Once you have made a match, the symbols you have grouped together will vanish and new symbols will appear in their place. At the same time, the squares will sprout grass. If you manage to match up enough symbols, all the dirt squares in the grid will eventually be covered with grass. All of these actions growing grass and forming matching symbol combinations will reward you with points. If you can manage to move fast enough, you can even form new combinations from the dirt squares while the previous ones are still being cleared. In this way, you can quickly form several new combinations. There are even a few different ways you can form matching combinations. You can for instance, spin around two tiles at once instead of just one. You can do this by right-clicking on the mouse to rotate the tiles clockwise and left-clicking to rotate them the other way around. While you can rotate tiles even if they do not result in a match, you will probably want to avoid doing too many of these maneuvers. Doing so will likely catch the attention of the evil garden gnome, who is always on the lookout for such shenanigans. The gnome tends to look upon these actions with annoyance, and will scatter rocks all over, making a mess of your otherwise immaculate garden. These rocks can really be quite a hindrance to your gardening efforts, as any tiles that have rocks in them will not be able to sprout grass. In order to grow grass in these squares therefore, you will have to break them up by forming matching combinations in the tiles right next to the ones that have rocks in them. While the gnome may prove to be an annoyance, we have to admit that he does add a much welcome challenge to the game and keeps things from becoming too easy. In any case, the challenge that the gnome provides becomes all the more apparent in the later stages of the game when he suddenly has a rock launcher at his disposal! This makes things considerably harder for you since rocks can then show up even if you do not move any tiles. A further challenge is provided by the vicious frost attack which eventually creeps over all the tiles preventing you from spinning them around. The good news is that there are a few power-up options available that evens up the odds in your favor a little bit. These power-ups come in the shape of jars that players will be able to fill up with sand by matching objects of the same color. The Magic Fire power-up for example allows you to melt the creeping frost by matching up red colored objects such as the bugs and flowers. The Rock Breaker power-up on the other hand allows you to break up the rocks as you may have guessed. You can do this by filling up the green jar with you guessed it: green symbols such as ferns, bamboo, and green tiles. The downside to this power up scheme is that you can often go through the entire level of the game long before you can manage to fill up the jars. So while these power ups can be potentially helpful bonuses, there simply aren't that many opportunities to use them. The only part of the game where you can put these power ups to good use is in the final "Midnight" garden where you only have a tiny flashlight to work with in forming matching combinations. Interested in reading more detailed information about Enchanted Garden? If so Click Here for more details.